– EE-20A-3 – Three-Phase Current Source up to 20A on each phase. The Current Source is able to generate three-phase currents, synchronized with the service voltage, with unprecedented stability and measurement accuracy. The amplitude and phase-shift of each current is individually adjustable. The values of voltage, current, power, power factor, phase shift, THD and frequency are indicated on the LCD display. Two generation modes – Manual mode and Test Plan mode are at Operator’s disposal. The Test Plan mode is used for easy change of load parameters, using only one panel keypad button. 100 Test Plans can be predefined by the Operator, each one with 12 load values. 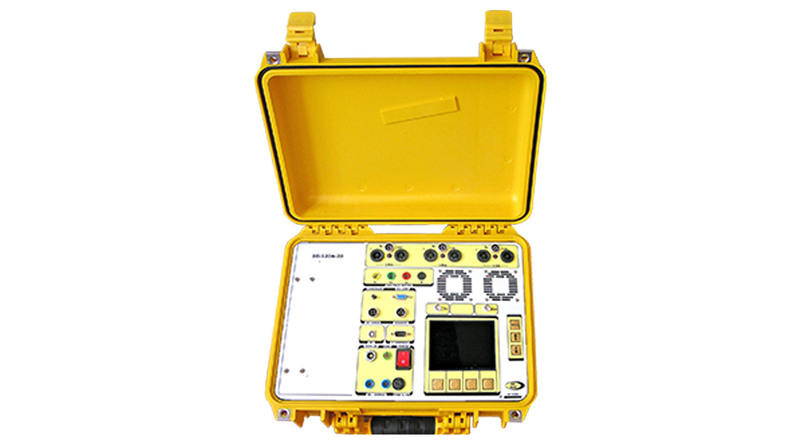 The unique stability and measurement accuracy make the phantom load suitable for testing not only electricity meters, but also other measuring devices in a substation like amp-meters, power and power factor meters. The EE-120A-3 unit can be upgraded with new firmware, which allows the integrated energy standard (class 0.04) to be used for testing electricity meters, thus forming an independent Test System. Optionally a Voltage generator up to 500V could be ordered, it is controlled from EE-120A-3 via RS485 interface. Output Power (per phase): 60VA max. 40VA max.